Aerosmith's future continues to be in doubt, and singer Steven Tyler isn't helping matters. The future American Idol judge has recorded a song called Love Lives that will serve as the theme song to Japanese movie called Space Battleship Yamato. According to Blabbermouth, the track (check out a sample in the above video) is being billed as Tyler's first solo project. The 62-year-old rocker wrote the ballad, which will also be released on 24 November in acoustic, piano and instrumental versions, after he received a video of the film's final battle scene and a screenplay which was translated to English. The song is apparently written from the point of view of one of the film's characters hoping to protect a loved one. Space Battleship Yamato stars Takuya Kimura and Meisa Kuroki and opens in Japan on 1 December. All of which is bound to irk those in the Aerosmith camp - as if they need any more Tyler-related headaches. Guitarist Joe Perry has made no secret of his disgust at the thought of Tyler participating in American Idol, calling it "one step above Teenage Mutant Ninja Turtles." In a recent interview with the Calgary Herald, Perry said, "When we put this band together, this is not something that [Steven Tyler] would do." 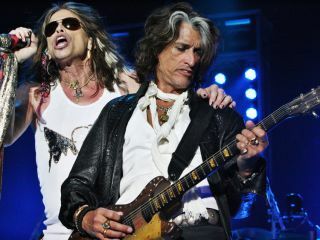 Not everyone agrees, however: Aerosmith's one-time A&R man John Kalodner recently offered his own insights on Tyler's new career moves to the New York Post, stating that Joe Perry was "completely wrong" when he said that Tyler would not have pursued being an American Idol judge during the band's early days. According to Kalodner, Tyler always "sought Hollywood recognition, and now he can get that." Kalodner added that "Joe is completely wrong. It's jealousy. He's ultra pissed off. If [Tyler] makes a giant success as a TV personality, he won't want to go back on the road. And there is no Aerosmith without Steven Tyler. Period."